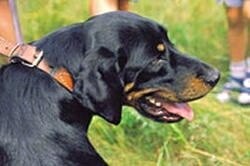 The Lithuanian Hound is sturdy, heavily boned, muscular and sleek, with a short, glossy black coat and limited tan markings. The tail is long and held low. This hound has less heavy bone than many other hounds his size. However he is still a good sized, robust dog; sleek but with muscular proportions. The head is moderately large and broad between ears. The eyes are brown and medium sized. The ears are moderate length with rounded tips and hang close to cheeks. The muzzle is medium sized and well-proportioned to the head. The nose is black and self-colored according to the coat. It has a scissor or level bite. The neck is moderately long, very strong with no dewlap. The topline is level and the chest is long, deep and broad. The body is medium sized. The legs and forelegs are perpendicular. The thighs are muscular and the hocks are straight and strong. The feet are strong and round, with compact toes. The tail is long, gradually tapering. This breed has a good reach, with a well-balanced movement. The Lithuanian Hound is an impressive sighthound. Determined, he is effective on hare, fox and boar. When hunting, this hound is very persistent with great speed and vigor. With his family he is pleasant and agreeable. This breed is known for its splendid voice. This breed is energetic, free-spirited, with good movement. Owners need to be firm, but calm, confident and consistent. Proper human to canine communication is essential. This energetic hound needs plenty of exercise. It needs to be taken on a daily, long, brisk walk or jog. It will also enjoy running beside you while you bicycle. While out on the walk the dog must be made to heel beside or behind the person holding the lead, as in a dog's mind the leader leads the way, and that leader needs to be the human. The all-weather coat of the Lithuanian Hound is easy to groom. An occasional brushing will do. Lithuanian hunters crossed local big-game hounds with Beagles, Bloodhounds, Polish Hounds and later Russian Hounds. The Lithuanian Hound is an attempt to recreate the original-type Curlandish Hounds, which were associated at one time with the Latvian Hound. In the 1970s the Lithuanian Hound was low in numbers. During the 1976-77 hunting season, many fine dogs were killed by boar, and the breed was close to extinction. That year the Lithuanian Cytological Council created a special kennel facility for raising Lithuanian Hounds. 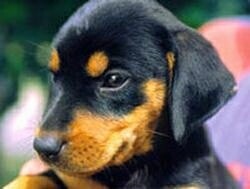 They appointed a specialist to be responsible for keeping the breed and a standard was written. 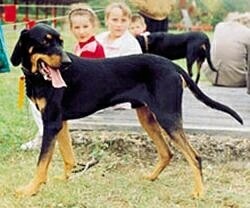 This breed is rare and is not usually found outside the Republic of Lithuania.